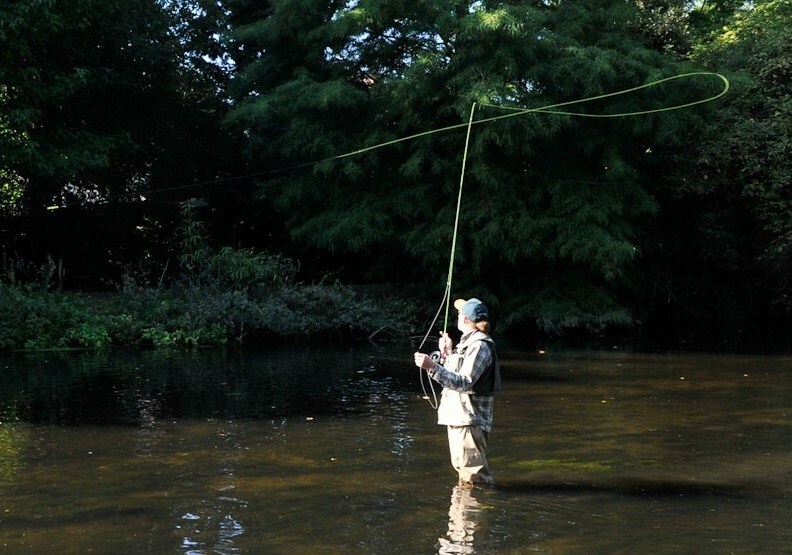 English casting instructor Alex Titov demonstrates the high rod stop, with the rod pointing straight upward, and he’s watching the line unfurl behind him, so he knows when to begin his forward cast. If you’re looking to improve your cast, start by perfecting your backcast. Here are three tips that will help you accomplish a better backcast and therefore, a better cast in general. 1. Start with the rod tip pointed down at the water. This allows the rod to move through a more complete motion, which provides it with more kinetic energy. Conversely, if you start the rod parallel with the water, you have decreased the backcast stroke dramatically, resulting in a decrease of potential kinetic energy, as well. 2. Stop your backcast with the tip of the rod pointed straight upward. This is most important, since it allows the stored kinetic energy in the rod to flex the rod, which is the whole idea behind the casting stroke. Be careful to not break your wrist. And don’t over-think this one. It’s simple. Stop the backcast with the rod tip pointed straight up, or at your ear, or next to your temple, or whatever works for you to that end. But straight up is the key. 3. Watch your backcast straighten out off the tip of the rod. This allows the rod to fully load for the forward cast and lets the line to achieve its proper speed relative to the energy in the rod. By keeping these three tips in mind, your backcast will improve greatly and as a result, so will your forward cast.